Recognizing the importance of maintaining our big Walleye, we instantly instituted a catch and release policy from day one of our operation so that we might share these beautiful TROPHY PIKE with you! Catch and release fishing is not just a marketing gimmick to us or something that was initiated recently out of necessity to save the fishery but rather it's a way of life for us. Our catch and release policy has allowed us to have 100% control of our fisheries. 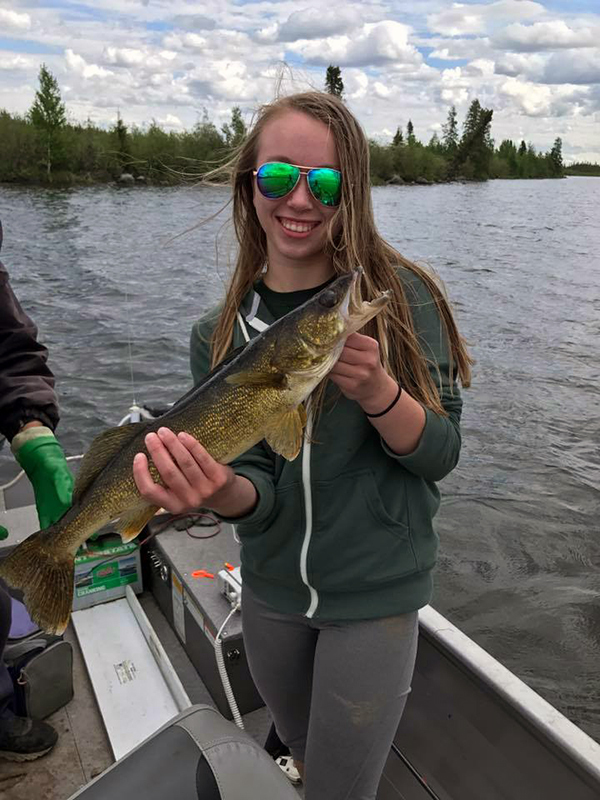 Kassidy Wendt (below) shows off her nice Walleye from mid June 2018. •With wet hands, lift the gill cover on one side slightly and gently slide your finger tips back towards the gill cover away from the gills themselves. Then slide your fingers in a curled position towards the snout. Now you can hold the fish easily, without the chance of getting cut from the gills. We understand that even when all of these measures are used that a small percentage of fish will still die. We ask that you do your best to help us be great stewards of these trophy fish.